SBI’s recent research report entitled How to Increase Marketing’s Contribution to 2015 Revenue was, as always, an interesting read. SBI’s research indicated that the majority of marketing teams are failing to make an acceptable level of contribution to their company’s revenue and the report covered some key areas where marketers are failing. I thought it would be interesting to talk about those areas, and offer ideas on how to fix that. The report estimated that as many as 71% of marketers were falling short of their revenue targets by adopting the wrong marketing strategies. The report identified six key areas in which failing marketers were commonly missing the mark and six steps needed to get back on track. No marketing strategy at all. More than a quarter (26%) of marketers reported having no clear strategy at all, or at least none that they could articulate. They reported that while they might enjoy the occasional success, essentially they’re relying on luck more than anything else. I find this is the case all the time. Clients (and just as many enterprise level ones as small to midsize ones) often don’t want to pay for strategy–they want to pay for tactics, without any kind of a strategy in place. As you might imagine, just the thought makes me a little twitchy. Relying on tactics instead of strategies. As mentioned above, people want tactics, not an integrated marketing strategy. 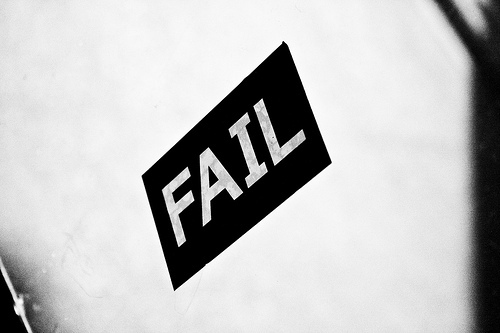 While a compilation of marketing tactics may occasionally produce some results, more often it’s a crap shoot. The lack of a systemized, integrated marketing strategy is likely to mean that positive outcomes are difficult to achieve and/or difficult to repeat on a consistent basis. An example of a tactic without a strategy is when someone decides they need to hire someone to “do social media” for them. There’s rarely a thought, much less a strategy in place, to develop content for use in social media channels that’s specifically tied to business goals. There’s rarely any focus on a competitive analysis or the importance of listening and monitoring and using data to drive an overall social media strategy.Another example relates to brands’ efforts at content marketing. Everybody on the planet is scrambling to create content for their corporate blogs, yet it never occurs to anyone that writing is the easy part, getting anyone to read that content is what takes skill. When the content doesn’t do anything magically to attract readers and drive traffic, the notion that content marketing has failed is common.Both of the above are tactics. Tactics alone aren’t enough. You have to have a strategy (or multiple strategies) in place connecting your various marketing initiatives and powering one another if you want them to deliver results. Having the same strategy as the competition. Being just like everybody else isn’t a unique selling point. It’s certainly not a compelling reason for someone to do business with you. And when marketers rely on strategies that are the same as everyone else’s, they set themselves up for failure. When consumers are unable to differentiate products or campaigns from the competition, it means that marketers are competing on price alone. In today’s consumer-driven economy, competing on price alone is not the smartest move. Being the company with the most compelling story, the best, most responsive customer service, a great brand personality – all those things serve to make a company unique and, hopefully compelling to consumers. Buyer needs not met by marketing strategies. Marketers aren’t focusing enough on the needs of their buyers as they develop their strategies (or tactics). If the marketing team’s strategy fails to address buyer needs, frustrated customers aren’t going to wait around—they are quick to find what they need, and the service and attention they crave, elsewhere. Brands are slowly starting to get this. We are starting to see the tide shift and we’re beginning to see roles like Chief Customer Officer or Customer Experience Officer appear. I was reading an article just today about The Gap and Banana Republic eliminating CMO positions in a restructuring effort designed to “intensify consumer focus and break-through with a truly dynamic and integrated approach to building relationships with our customers” (Jeff Kirwan, global brand president of Gap). Marketing strategy misaligned with corporate strategy. In many instances, the marketing team is still considered a department of order takers or there’s not an integration of marketing with other key departments within the company. Research shows that companies who align marketing and sales experience greater growth and profitability. Sales teams no longer are solely responsible for finding leads and driving business–that’s something marketing plays (or should play) a huge role in. In many instances, we’re not there yet, but we’re starting to see more and more companies focus on alignment, which is a good thing. If you want to know more about how to do this, I like Hubspot’s Complete Guide to Unifying Your Sales and Marketing Efforts (registration required). It walks you through things like closed loop reporting, the things sale should be reporting to marketing on, the things marketing should be reporting to sales on, how to identify your “winning” marketing channels and much more. It’s definitely worth your time to check out if sales and marketing alignment is a goal for you moving forward. Marketing strategy misaligned with product strategy. SBI’s research reported that it’s not at all unusual for marketing strategy to not be aligned with product strategy, which will have an impact on growth and profitability. Many times marketers know this, it’s simply not happening within their organizations. And naturally, just as it’s important to align sales and marketing within your organization, it’s equally important to align your product development and customer service operations. Your customer service team (and your sales team) are truly the front lines of your company. Your sales team is well aware of the objections to the sale they hear most often, and the most common barriers to a sale. As such, integrating their feedback into your R&D operations and using that feedback to fine-tune existing products or to lead your efforts in developing new products, as well as integrating that feedback into your marketing strategies, is key. Likewise, your customer service team is well aware of the most common problems customers experience and can play a key role in your R&D operations—if only you let them. Segmentation – market, account and buyer. Planning – revenue, budget, product, campaign, data and content. 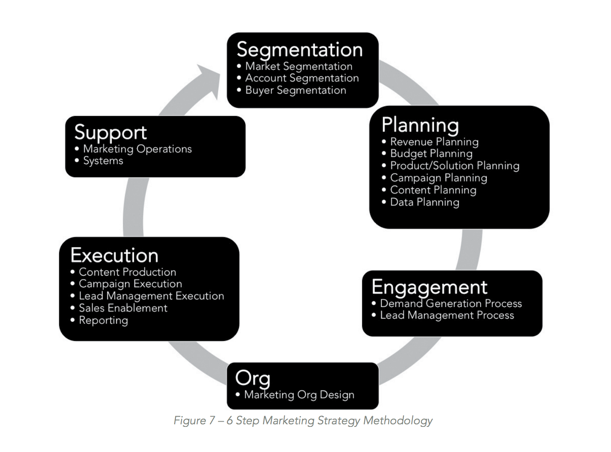 Engagement – demand generation and lead management. Execution – content, campaign, lead management, sales enablement and reporting. Support – operations and systems. This visual gives you a nice overview of some of the information above. If you would like to learn more then you can download the full study at “How to Increase Marketing’s Contribution to 2015 Revenue” (registration required). Without question, marketers have a tough job today. Marketing is becoming more and more sophisticated and many marketers either lack some of the skills they need to do the kind of job they would like to do, and should do, or they lack the budget and resources internally to make that happen. Or both. Best-in-class marketers know they have to keep learning, keep experimenting, and keep adapting in order to deliver the kind of results that can make a difference. Hopefully the information here helps you if these are things you’re thinking about and/or struggling with. If you have any thoughts on any of the items covered here, I’d love to hear them. If this is a topic that interests you, check out the Integrated Marketing Summit Workshop Series. Visiting nine cities in 2015, including Dallas (3/5), Phoenix (4/1), Fort Lauderdale (4/23), Minneapolis (5/19), NYC 6/24), St. Louis (6/7), Columbus, OH (8/5), Kansas City (10/8), and Atlanta (11/12), these workshops are designed to give attendees a hands-on deep dive into topics like social selling, B2B Lead Generation, B2C Lead Generation, Social Media, SEO, Content Marketing and there are three different workshops offered in the morning sessions and three in the afternoon sessions. Reasonably priced, great content, and limited to only 30 people per session, this is a way you can get the information you need with only a small amount of time out of the office.